Three complete novels of mystery in space from Grand Master Robert Silverberg explode back into print for the first time in decades in this thrilling new Planet Stories collection. These extremely rare tales originally appeared in the legendary Ace Double novel series, and represent a future multiple Hugo and Nebula award-winning author bridging the rollicking, action-oriented science fiction adventures of the early pulps with more introspective themes from the new wave that swept SF in the 1960s. From the shadowy secrets of Old Earth in The Chalice of Death to the mysterious pirate world in Starhaven and the time-shrouded superweapon of humanity’s ancestors in Shadow on the Stars, these three novels of science fiction mystery blaze back onto the scene in this brand-new collection, revealing the early masterworks of one of the genre’s most gifted and celebrated storytellers! In The Chalice of Death, a human from the far edge of space must track down the legendary planet that birthed his race tens of thousands of years ago. For the legends hold that the long-forgotten Earth holds the Chalice of Life, and the Chalice of Life holds immortality! In Starhaven, interplanetary fugitive Johnny Mantell flees authorities to the artificial pirate world known as Starhaven, sanctuary for the criminals and misfits of space. There he finds a new home for himself—as well as questions about his past, his future, and his very identity itself! In Shadow on the Stars, deep space colonist Baird Ewing returns to Earth for the first time in the thousand years since his ancestors first departed, seeking aid against the aliens who seek to destroy his colony. But the weapon he finds upon the ancient Earth can save only one planet, and Ewing must choose between his two home worlds. Seldom or never reprinted since their original appearances and with a new introduction by the author, these three novels of science fiction adventure blaze back onto the scene, revealing early masterworks of one of the genre’s most gifted and celebrated storytellers! 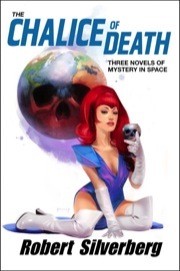 Sign in to start a discussion about The Chalice of Death (Trade Paperback!